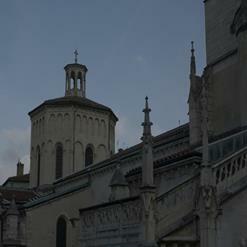 The oldest church in Lyon, and also one of the oldest in France. The site is built on a Gallo-Roman necropolis which was in use for centuries, until the Middle Ages. Some sarcophagi from the 5th or 6th century are visible in the courtyard. The crypt dates back to the 9th century and was renovated in the 19th century.